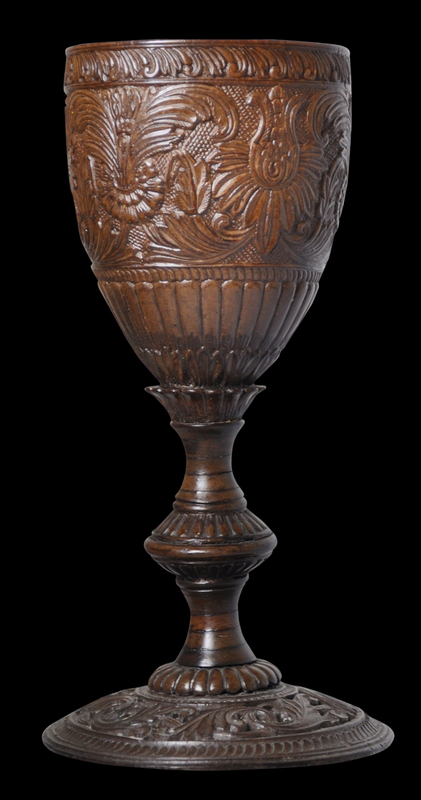 This splendid goblet is made entirely from carved and turn coconut shell. Made for the European market, it is typical of what might have ended up in an 18th century European ‘cabinet of curiosities’. The cup itself, the stem, and the base, have all been made separately. The base is slightly domed and pieced. It is carved with elaborate foliate scrolls. 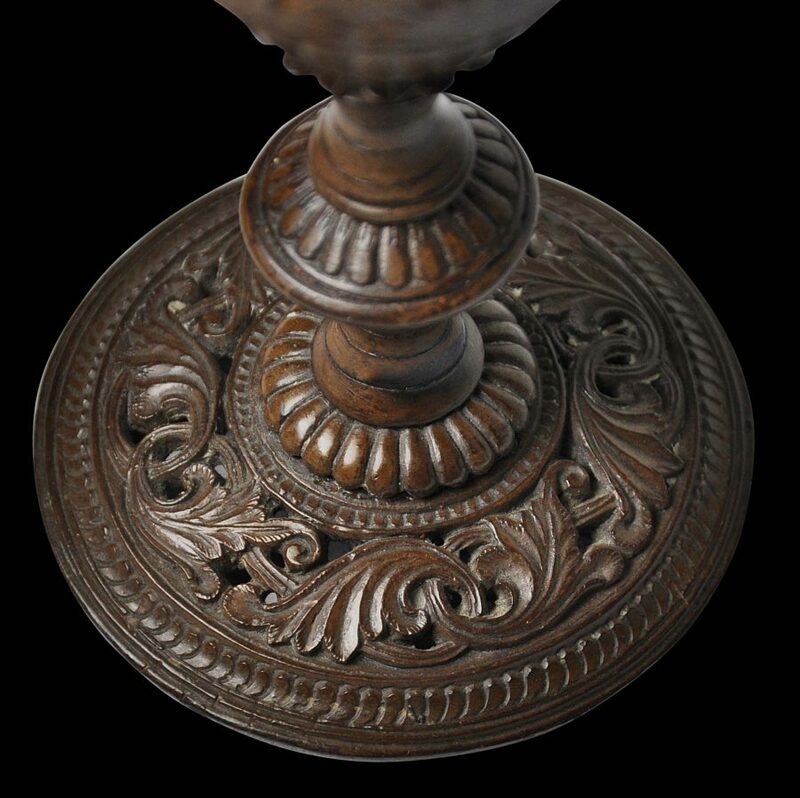 The stem is of baluster-form with lotus petal bands. The bowl or cup is beautifully carved with repeated, interlocking stylised pineapple floral scrolls against a cross-hatched background. 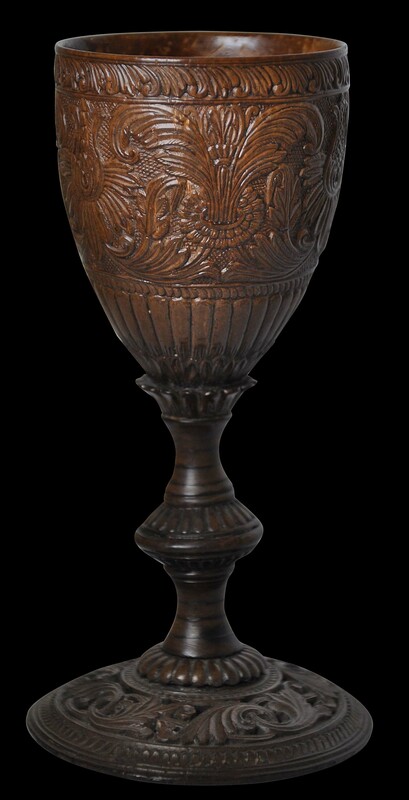 The goblet is in the genre of such carved coconut shells from sixteenth and seventeenth century Sri Lanka. See here for Lot 220 in Sotheby’s ‘Arts of the Islamic World’ October 6, 2010 for a small carved coconut cup attributed (perhaps ambitiously) to the sixteenth century. The pierced work on this cup is similar to the pierced work on the foot of the goblet here. The goblet here has a honeyed brown patina and is in perfect condition. Jordan, A., & J. Beltz, Elfenbeine aus Ceylon: Luxusguter fur Katharina von Habsburg (1507-1578), Museum Rietberg, 2010. Moura Carvalho, P., Luxury for Export, Gutenberg Periscope Publishing, 2008. Vangeyzel, G.E., Traditional Textiles in the Colombo National Museum, National Museum of Sri Lanka, 2008.